Bruce Willis, the undefeated Die Hard and Hollywood’s ultimate action hero may be defeated by an Internet paparazzi. Yesterday a Youtube user shared a video in which Mr Willis is seen chatting with the cameramen between takes. In the video one of the crew members asks him about President Obama’s policy and Bruce uses the N-word in his respond. American society was shocked with actor’s unacceptable behavior, but it split into two camps. Some Americans think Willis is a distinguished citizen who saved America and even Earth several times and he should be forgiven. “So he made one tiny mistake. Think of the times he saved us from asteroids and terrorists. Besides when he said that on the camera he had no idea he was being filmed” says Jonhatan Lynch from Mobile, Alabama. Entire world is now guessing will President Obama take the N-word personal and what would his retribution be. Yellow press is full of gossips: some say Bruce Willis will never make another movie, others say he is likely to move to Russia and continue his work there and some even say that actor Vin Diesel is behind this scandal, because he thinks he looks like Bruce Willis even more than Bruce Willis himself. Allegedly Vin Diesel bought the tape and posted it on Youtube. Time will only show what will happen to Bruce Willis, all we can do is judge him ourselves and below is the transcript of what Bruce Willis actually said. “Cameraman: So Mr. Willis what do you think about President Obama’s efforts to stop global warming? Retribution should be severe, because one should never say never especially in a country where an Austrian muscle-head became a Governor and where Paris Hilton is considered to be beautiful. 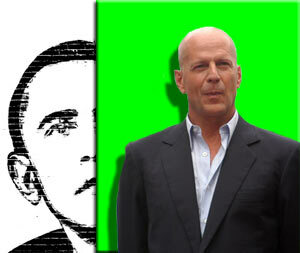 As a punishment we suggest Barrack Obama to ban Bruce Willis from making another pathetic sequel to Die Hard and to tattoo words “Never say never” on his shiny egg-shaped head.